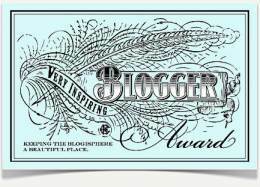 Earlier this spring two fellow bloggers shared awards with me. Unfortunately my growing list of competing priorities have slowed my response--and my ability to follow the ever growing list of great costume / history blogs. ...Loni from Clearwater Cottage for passing along the Leibster Blog Award! Last year my brother won a big ol' flat screen TV in a golf tournament that I ended up with it. (Such a struggle right?) This thing has wifi so I'm loving watching all the random stuff on YouTube this like this fascinating presentation by Dr. Ballard about finding the Titanic . I can walk to the beach from my house. I love coffee and most coffee drinks. My sister dances in a professional contemporary dance company. As I've mentioned before, I'm crazy about Instagram. 1st Foot Guards - This newer and growing Instagram site has reenacting photos. Cath Kindston - The British handbag company has a fun page and I'm loving following their photos of their new marketing campaign celebrating their 20th anniversary, Everything's Coming Up Roses. New England Living - Alyson's photos of the New England landscape and architecture are simply stunning. The Freedom Trail Run - As they sum it up: "The active way to tour Boston." Gizziello - Gio's photos capture 18th century Italy. Rev War Heart - Jac's architecture photos are among my favorites on Instagram. Drifting Focus - Kelsey, who you may know from her blog HistoricallySpeaking.DriftingFocus.com, is a dedicated photographer. Ornamented Being - Lizzie, who you may know from her Tumblr page Ornamented Being, captures London and I especially enjoy her sewing adventures. Newport History - One of the few museums with an Instagram page. The Bury Man - More photos of historic Boston. Here's a little preview of summer posts: heirloom plants, a new shift, sewing a sea bag, and decorating with 18th century inspiration. Time to get back to work!